KUWAIT: Criminal detectives arrested a policeman who used his patrol car to store forged currency and dispense it. The policeman was sent for a court martial before being sent to the prosecution, accused of forging and dispensing currency. He was also ordered to remove his uniform. Firemen saved a child who had his hand stuck in the escalator inside a mall in Salmiya yesterday. Firefighters arrived to the scene shortly after the incident was reported, and they managed to free the boy before he was examined by paramedics who determined that his injuries were minor. 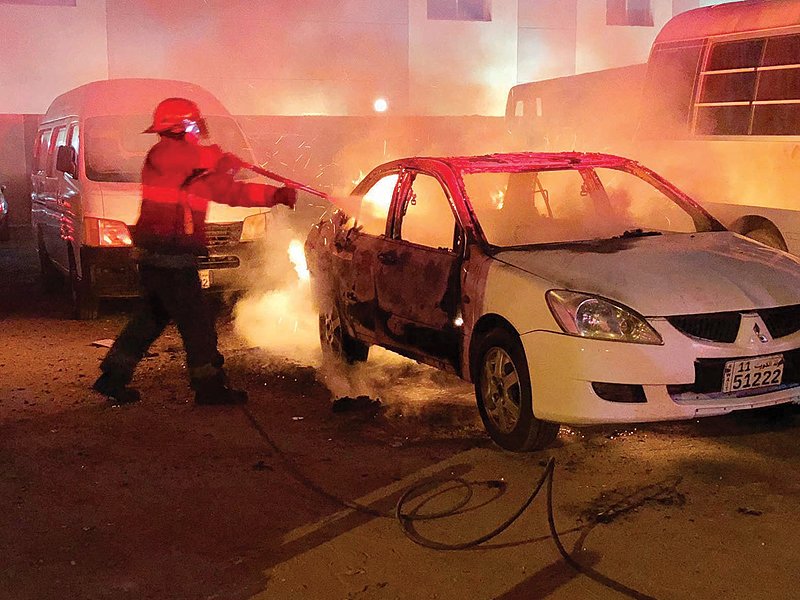 Farwaniya fire department led by Lt Col Khalid Kanaan responded to a call about a fire in a vehicle in Khaitan. The fire was put out without injuries. An investigation was opened to reveal the cause of the fire. Police intervened to break up a domestic fight when a Kuwaiti’s second wife attacked the house of the first following some problems. Interior ministry operations received a call about a fight between a citizen and his wife in front of his house. Police patrols responded and broke up the fight. A security source said the citizen accused his second wife of attacking his first, despite buying her a house and warning her not to approach his first wife’s house. Legal action is being taken. Hawally detectives are looking for an Asian domestic helper accused of stealing jewelry and KD 500 from her sponsor before escaping. The citizen told a Hawally governorate police station her helper stole gold and cash. A nurse told police that while she was on duty, she was surprised by an obstetrician/gynecologist who was alone with her in a room. He started flirting with her and started to mention parts of her body, then asked her for “more” as no one could see them. A complaint was lodged for incitement of immorality, and detectives are investigating. A citizen accused a driver of a defense ministry vehicle of deliberately crashing into his vehicle. The interior ministry received a call from a citizen saying he was involved in a deliberate collision on Arabian Gulf Road. A traffic patrol went to the scene, and the citizen accused the driver of a defense ministry vehicle of deliberately colliding with him following a dispute over the right of way.